Viking Books for Young Readers, 9780425287682, 60pp. 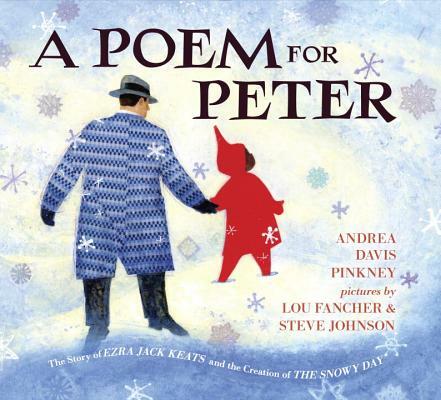 The story of The Snowy Day begins more than one hundred years ago, when Ezra Jack Keats was born in Brooklyn, N.Y. The family were struggling Polish immigrants, and despite Keats’s obvious talent, his father worried that Ezra’s dream of being an artist was an unrealistic one. But Ezra was determined. By high school he was winning prizes and scholarships. Later, jobs followed with the WPA and Marvel comics. But it was many years before Keats’s greatest dream was realized and he had the opportunity to write and illustrate his own book. For more than two decades, Ezra had kept pinned to his wall a series of photographs of an adorable African American child. In Keats’s hands, the boy morphed into Peter, a boy in a red snowsuit, out enjoying the pristine snow; the book became The Snowy Day, winner of the Caldecott Medal, the first mainstream book to feature an African American child. It was also the first of many books featuring Peter and the children of his — and Keats’s — neighborhood. Andrea Davis Pinkney’s lyrical narrative tells the inspiring story of a boy who pursued a dream, and who, in turn, inspired generations of other dreamers. Today, Ms. Pinkney is the distinguished and bestselling author of many books for children and young adults, including picture books, novels, and non-fiction. Her books have received multiple Coretta Scott King Book Awards, Jane Addams Honor citations, nominations for the NAACP Image Awards, the Boston Globe/Horn book Honor medal, and many other accolades. In recognition of her significant contributions to literature for young people through her body of work, she was selected to deliver the May Hill Arbuthnot Lecture. Andrea Davis Pinkney lives in Brooklyn, New York, with her husband and frequent collaborator, Brian Pinkney, and their two children. Steve Johnson and Lou Fancher have illustrated numerous books together. Among the most critically acclaimed are My Many Colored Days by Dr. Seuss; The Frog Prince, Continued by Jon Scieszka; and Silver Seeds by Paul Paolilli and Dan Brewer. Steve and Lou live in Moraga, California.